Increase pitching velocity, reduce arm stress, shorten the hitter’s reaction time… all by more effectively using leg drive! When I give pitching lessons to young pitchers including 8-year-olds or 10-year-olds or even some 12-year-olds it is not always easy to simplify certain parts of the explosive pitching motion into words that young pitchers easily grasp, and I would say that one of the concepts that is the hardest to translate for students is the idea that a lot of pitching speed comes from using their lower half, their legs. I can’t tell you how many times I’ve said the phrase “drive out, don’t step out”, but when I look down at their young faces I can tell in their eyes that they don’t fully understand what I’m saying. And I know for sure as with most other technical learning opportunities for athletes that when they feel it, they understand it. What I mean is: I can say to a youth pitcher again and again to “use your legs”, “use your legs”, “use your legs”, but until they feel what I’m trying to communicate they usually don’t actually understand how to do it correctly. I’ve tried many drills to try and translate the idea of using the lower half to generate speed, but no drill has communicated leg drive as effectively for me as a recent product that I tested. The product is called The Queen of the Hill and it’s made by Ground Force Sports. To test the product I used it for individual and group pitching lessons for girls ranging from 8–19 years old in a few different indoor locations, including on an indoor gymnasium floor (on the east coast in the cold winter months, which is a great time to focus on mechanics and drills and building better pitchers it is very common and inexpensive to utilize school gymnasiums). Since most school gym floors are highly waxed and buffed they are very slick, so anything you put on them slides. 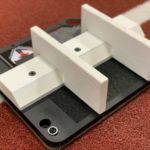 I would suggest if you’re going to use it on the gymnasium floor, which we used at a local elementary school where I give group pitching lessons that you buy a cheap roll of shelf tack and place a piece underneath it to add an extra level of stickiness. You can also use a bit of the shelf tack to wrap around the handle then as you carry the product (if you’re going to be carrying it for long periods of time); because the product is very durably made and has understandably for a durable product a certain amount of weight. It is not cheaply made, put it that way! I also used it at my two indoor hitting and pitching facilities for which I am a pitching instructor at in Gap, PA and Manheim, PA, which it was then used on a turf mat, and I also used it on regular AstroTurf. The product performed well on all surfaces, in any case. So after having pitchers from 8 years of age all the way up to 19 years of age test the Queen of the Hill I’m satisfied to say that I recommend a product. 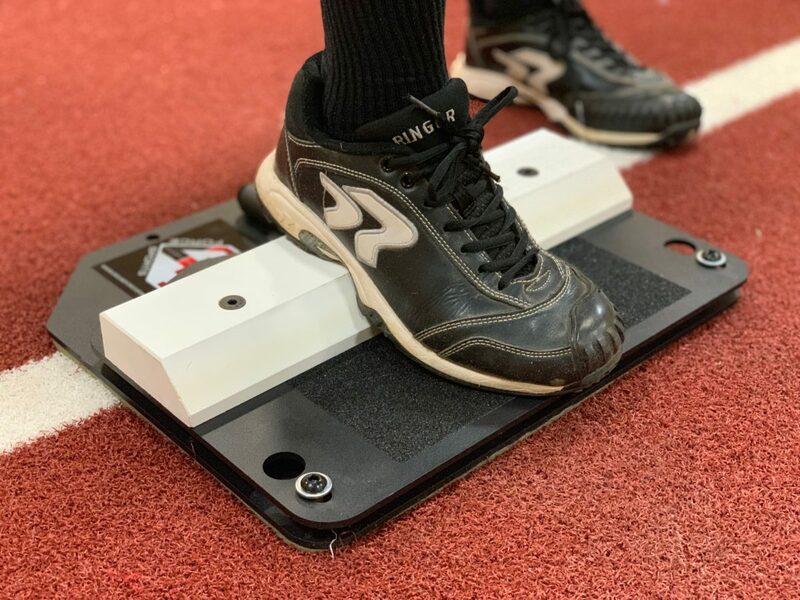 I’d even go so far to say that this product is that missing piece that I’ve been looking for in order to help young pitchers understand the abstract concept of generating speed from leg drive. The product easily does this because the girls feel and hear a click that reinforces when they have used their leg drive correctly. I also like the fact that the Queen of the Hill has a bit of a slant to the plastic pitching rubber, so the girls can become acclimated to digging the ball of their front into the mound to get a slight angle so they can drive out towards the 8 foot max range of the fastpitch softball pitching circle. I also like that when the girls start to make the machine click correctly and start to feel the proper leg drive you can crank up the spring to help them take the leg drive to the next level and drive out even harder, which helps build more muscle, more acceleration, and more explosiveness to throw faster. And when they achieve the tightest compression of the original spring the designer has included an additional stiffer spring so that she work out at an even higher level. Increase pitching velocity—THROW HARDER, PITCH FASTER! 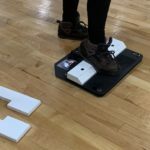 I recommend this device be used regularly in those specific sessions or lessons that are designed to work on leg drive or for building lower-half power. This may be one lesson out of a four lesson monthly cycle or maybe two, but the opportunity exist to use it regularly as a training aid to get pitchers to use leg drive more consistently and therefor more naturally, throwing harder. Inconsistent use of proper leg drive (including foot angle) is one of the top reasons that girls have inconsistent speeds. 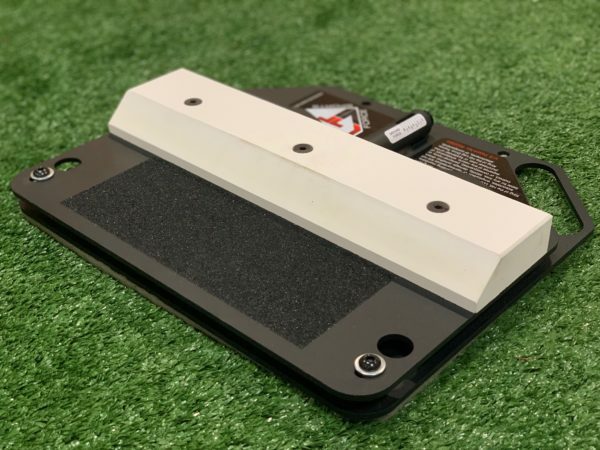 Speaking of foot angle… the other brilliant add-on to this product that I highly recommend are the walls, so that the pitcher will also start to feel and develop a leg drive that drives straight out, a leg drive that utilizes the power-line and the physics of the explosive pitching motion in the most efficient way. These walls are designed to help keep the foot straight as the leg drives out, which consequently uses the correct larger leg muscles (the quadriceps, which are the strongest and leanest of all the muscles in the body) and are extremely more explosive than the inner thigh muscles (AKA hamstrings), which get used more when a pitcher incorrectly turns her foot early before striding out. The use of the product is pretty straightforward. You instruct pitchers to get on it and just pitch like they normally would. If they don’t hear the click, then it’s likely the girls are not utilizing their legs or they’re utilizing a drive off of the mound that may be going a little bit more north then out, like it should. Once they get it to click, like I said you can crank up the spring and continue to work on building their leg strength so they can continue to drive out harder and harder and continue to make the product click and give the reinforcement that it’s being done correctly, ultimately increasing pitching velocity. On top of using the product as designed, I also had some fun and some success with teaching my young pitchers to do walk-throughs off of the leg drive machine. This adds another component of timing to the leg drive and to which it can at the very least also work on coordinating the upper and lower-half timing. One of the most powerful aspects of the product in general is that my pitchers have fun using it and ask to use it when they see I have it with me. If you have specific questions about this product or any of the strategies I discussed, then please feel free to leave them in the comment section below.